Seventeen months ago, Bleeding Cool first told you that Doomsday was going to be in Batman Vs. Superman. But it was the trailer proved it. Internet reaction was massive. Especially on eBay. The first appearances of Doomsday have been collectible ever since the character killed off Superman back in the nineties. Yesterday saw the most collectible, Superman: Man Of Steel #17 in CGC 9.8 sell for $235 for the first print, $225 for the second print, $220 for the news stand and a raw copy sold for $70. 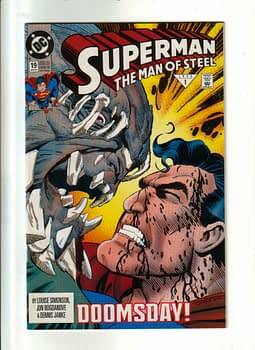 As for the first comic to feature the character on the cover, Man Of Steel #18 in CGC 9.4, the fifth printing has sold for $195 and raw for $90, the first printing in CGC 9.8 for $180, the third printing for $150, the second print for $120, and the fourth printing raw for $107 and the fifth printing in 9.2 for $100 or raw for $90. While Man Of Steel #19 featuring the first full face of Doomsday on the cover has also had a bump – but there were bargains to be had, especially amongst the Buy It Now brigade, where that issue was bought for $3.40 as the trailer hit… but the second print is up to $14. For comparison’s sake, Man Of Steel #16 recently sold for $2.40. Meanwhile the overhyped Death Of Superman black bag edition, as the big guy died at the hands of Doomsday, finally justified being bought and stored for so many years as a copy hit $15 on eBay, up from its $2.50 price tag in 1992. Although if you had spent that $2.50 on Apple stock at the time, it would now be worth over $11,000….